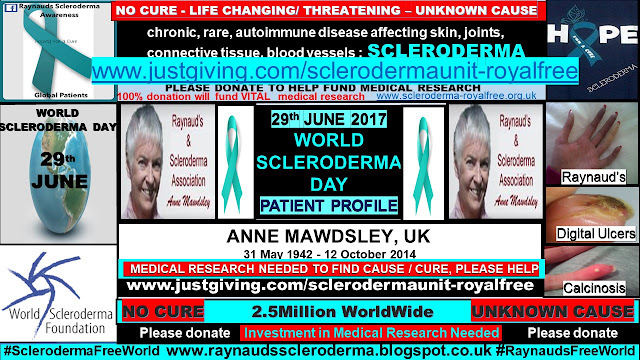 I have chosen to make Anne the focus of the final day of my Scleroderma Awareness 2017 Patient Profiles Campaign. Without a shadow of a doubt, the entire global scleroderma and Raynaud’s community are eternally indebted to Anne for her tireless fundraising and relentless awareness raising, having set up the Raynauds & Scleroderma Association in 1982. Like most scleroderma and Raynaud’s patients, Anne was a character who you would never forget, after first meeting. Her zest for life and ‘can do’ attitude, regardless of living with a body which had been consumed with the diagnosis for decades, was frankly, extraordinarily superhuman. I accept that there are no two scleroderma and Raynaud’s patients who present with the exact same set of symptoms, and so, direct individual patient comparisons can not be used as an accurate, scientific measure of outcome prediction or individual symptom severity. But, by being an example of how to live with this diagnosis with respect for the symptoms, Anne showed that it can be done. This has given me tremendous strength in persevering through some of my more challenging days - 365 days of the year, over the last, what will soon be, 20 years! And, encouragingly, the ‘long term’ patients included within my Scleroderma Awareness Month 2017 Patient Profile Campaign, also show that it is possible for the disease to become latent, manageable, and, in my personal experience, reversed. For, 19 years post diagnosis, on 30th November 2016, Prof Chris Denton confirmed that ‘my skin has now cured from scleroderma’. However, I was lucky – I had an early-ish, early diagnosis, where treatments to suppress the symptoms (not a cure), still remained a viable option to me, even though my name was included on the stem cell transplant list, during this time. Consequently, through early-ish intervention, I have minimal internal organ damage other than severe GERD and MSK joint pain as my most severe symptoms, making for my full time job. From first being diagnosed, initial diagnosis, back in Autumn 1997, Anne was of huge support to my family and I. Although, for my first decade of living with the diagnosis, my family had more contact with Anne and the RSA than I, as I was still not ready to talk so ‘matter of factly’ about the diagnosis, and how it had turned my world upside down and shattered my dreams. Anne created and set up the RSA in 1982, which included an annual conference aimed at patients and families alike. I know that my family benefited greatly from the information provided at this forum, as well as, were helped with their understanding, by meeting others in the same ‘scleroderma boat’. Over the years, I watched Anne, each year, challenge herself and her body, with the most ‘crazy’ fundraising events, which she subjected her body to. One such event was a sleigh ride with huskies in Finland, which the scleroderma medical genius trailblazer, Prof Chris Denton, had strongly advised against! 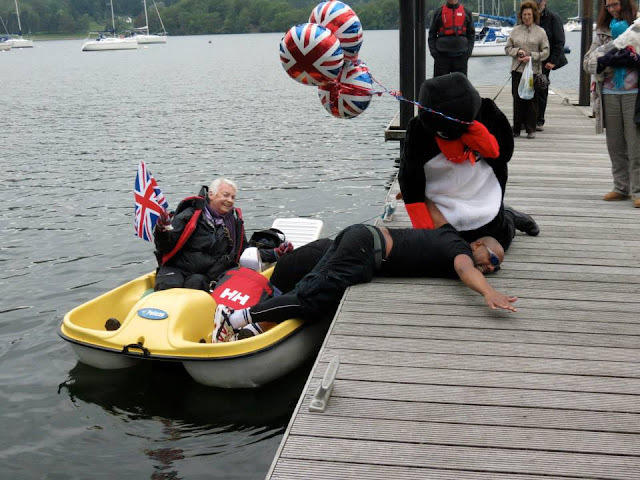 Another event, and, sadly, the last time where I saw Anne, was her pedalo challenge down Lake Windermere, June 11th 2012, with an actor from the BBC1 drama ‘Eastenders’. Although it was an early summer’s day, the temperature thought otherwise, and by the finish line, Anne was shivering with cold. But, hats off to Anne, she DID it, with her devoting and loyal husband, Harry, supporting her throughout. I often joked with Anne that ‘I needed a Harry’ as their unconditional love for each other was so heart warming and endearing. The photo below shows Anne at the finish line. I am on the right of the photo, holding my white dog, Mitzy, as the swans were tying to attack her! It was a great day, to be able to share 'the moment' with Anne, and, in one of my favourite places in the world, even though the temperature was rather refreshing for a Raynaud's and scleroderma patient! I also had the opportunity to meet the lovely fellow patients Bev Myers and Hannah Gray. Anne was great at bringing everyone together, united by our rare diagnosis. I have written about ‘Living the dream being your own Raynaud’s and Scleroderma advocate’ here, a role which I am truly humbled by. I owe huge thanks to Anne for developing me into such a scleroderma and Raynaud’s parrot without me realising, at the time! Anne was good like that – she told me that she had even got Prince Charles to agree to sign her book when he planted a tree in celebration of the RSA 20th anniversary at Highgrove. As I highlighted at the start of this piece, if you had met Anne, you would never have forgotten her. 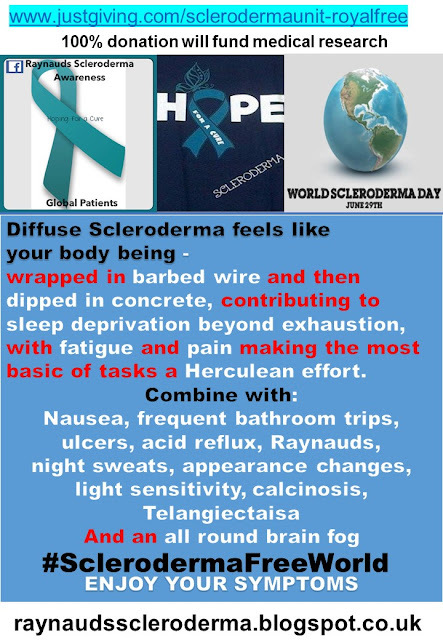 Last year, driven by Anne’s work, I set up this blog space as well as a Facebook page and a google plus community, with all donations going direct to fund medical research at the Scleroderma Unit, The Royal Free Hospital, led by Prof Chris Denton. It is with deep sadness that I am writing this profile, however, I know that Anne is in a pain free, scleroderma and Raynaud’s free, place now. I am truly grateful for her friendship and all that she did to pave the way to improve the landscape for patients in so many aspects. This was highlighted and recognised within the P152 Poster ‘Optimizing Scleroderma Centers of Excellence: Perspectives from Patients and Systemic Sclerosis (SSc) Experts’ presented at the 4th Systemic Sclerosis World Congress held in Lisbon last year. Forever within our hearts, and whose legacy will live on. It is with huge thanks, I owe to ALL of the patients who took part in the Scleroderma Awareness Month 2017 Patient Profiles Campaign - Research. Which, had not been envisaged by me, whilst the idea of the campaign was in its infancy. My Sjogren’s overlap symptoms were on strike for a few/most days during June Scleroderma Awareness Month! Living with this diagnosis makes you dig deep into finding out who you really are, and what / who, is truly really important to you. As Bob Marley sang, ‘You never know how strong you are, until you have to be’. As well as, the Campaign has highlighted universal global patient unmet clinical needs.